World Borders: How to get from Tiraspol to Chisinau. 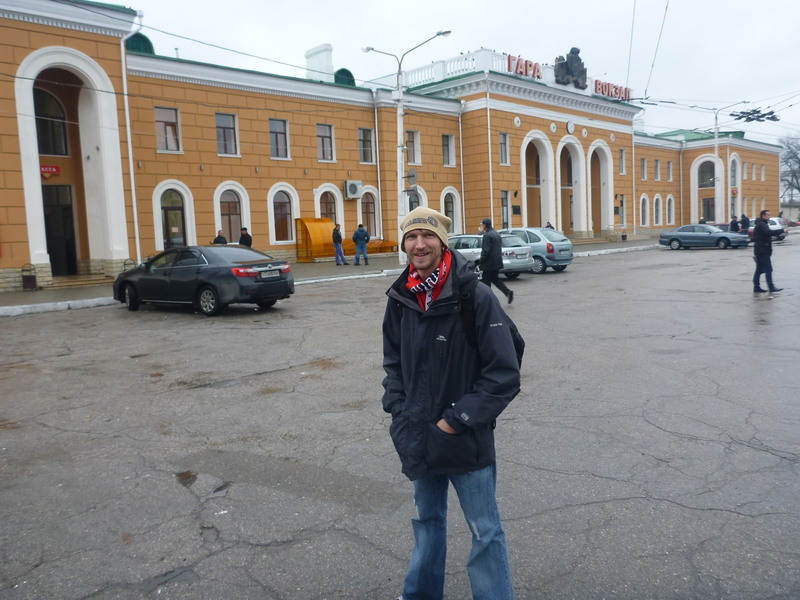 You might have heard that I went backpacking in Tiraspol, capital city of the rather unknown country of Transnsitria. I enjoyed a cool home stay with Ilya, including a local breakfast experience. Getting to Transnistria, I got a border bus from Chisinau to Tiraspol and have already written about that journey. Going the opposite way and back across the border is slightly different, albeit it on the same route. The reason being, Transnistria is old school, people speak Russian and so this is a guide to going the other way. 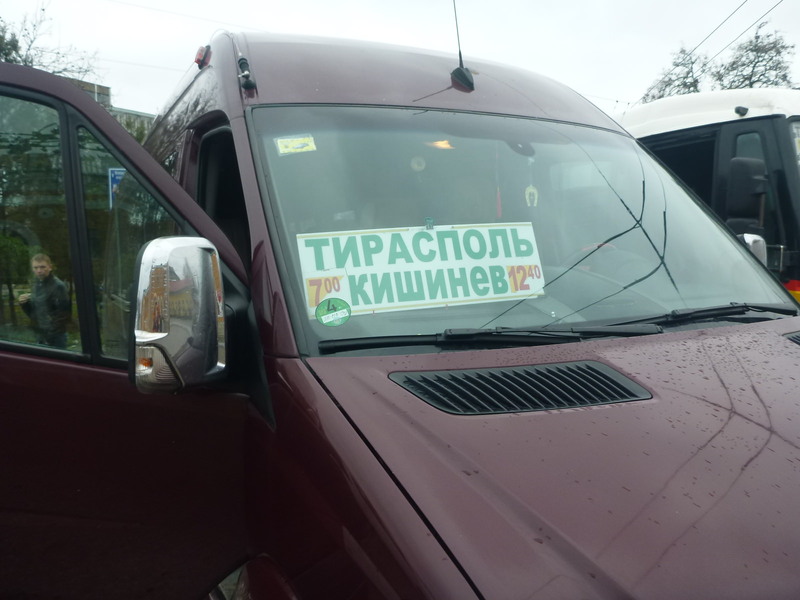 How to get from Transnistria to Moldova, by bus from Tiraspol to Chisinau. While in Chisinau, Moldova no ticket was needed coming here, you simply pay on the bus. 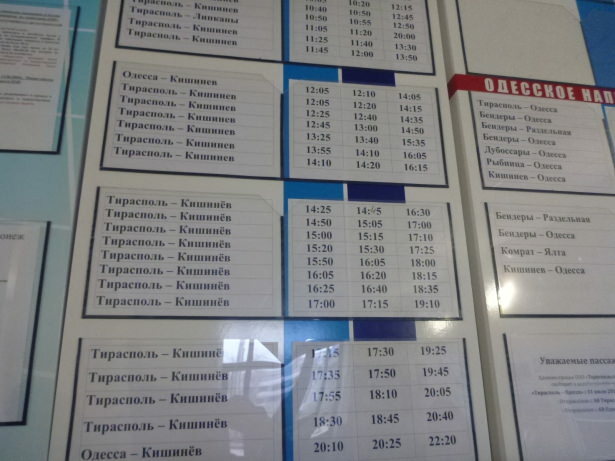 Transnistria is the opposite – you should buy a ticket in advance. Not only to secure your place, but just it’s the given thing here. Plus if you are a foreigner and you have a physical ticket in your hand to prove you are leaving the country, it can only be a good thing. Timetable of buses to Chisinau. So I bought a ticket. The train and bus station are in the same place in Tiraspol, the buses leave from outside the main passenger entrance to the train station. To buy your ticket for the bus however you need to go into the door on the left hand side of the train station as you face it. Head in there and go to one of the counters and just ask for a bus to Chisinau (pronounced Kishinaoh). There are two counters. If really in doubt, write Chisinau or Moldova by bus in Russian on a piece of paper (either look it up online or get your host to do it). 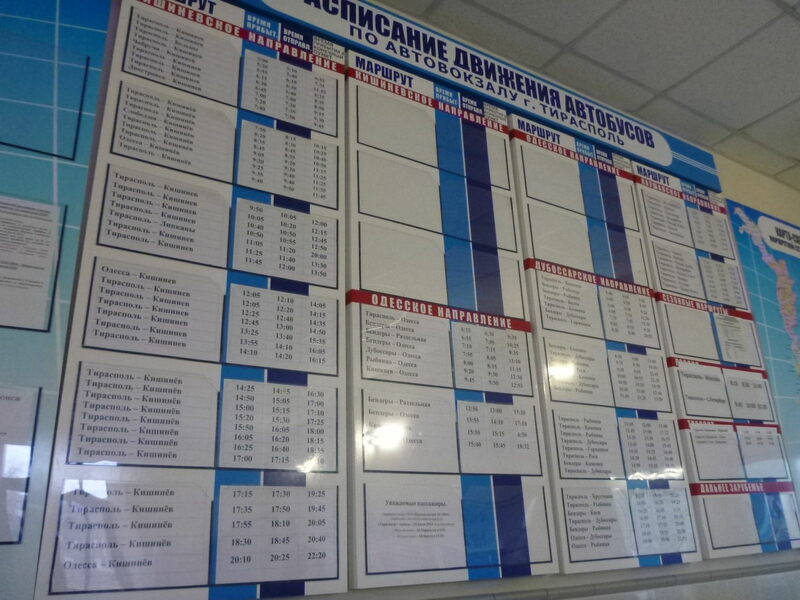 On the wall in the train station are a list of times of buses from Tiraspol to Chisinau. 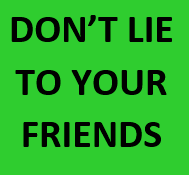 You will be surprised to know they are very frequent, like once every half an hour or hour. They fill up as well, so this is another reason to buy your ticket – just to make sure you’re on the very next bus. 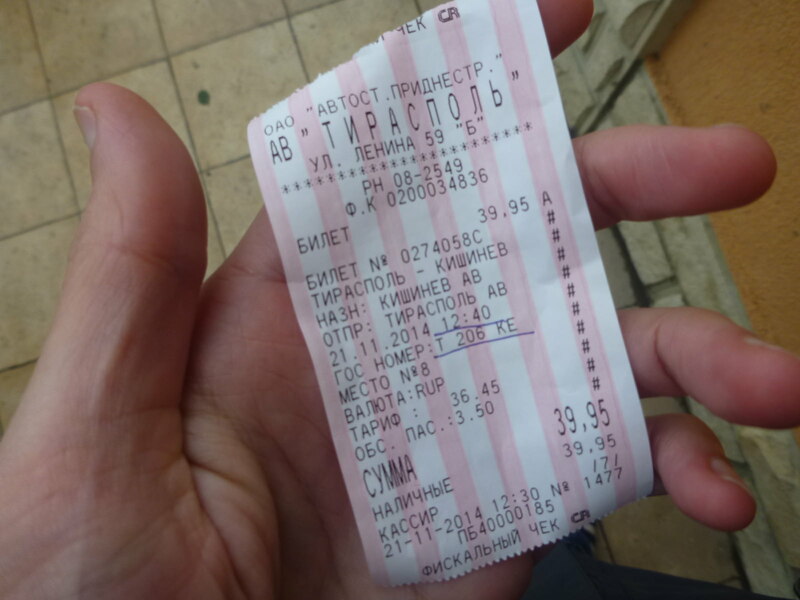 I bought my bus ticket from the counter in the train station at 12.20 pm, and the cost was 39.9 Roubles. This was in November 2014, the price could rise of course. Also before you leave Tiraspol, make sure you have changed all your Transnistrian Roubles back into Moldovan Lei, or even Euros or Dollars. There are money changers everywhere, including at the train and bus station. My bus ticket from Tiraspol to Chisinau. Once you have your ticket there is a date, time and number on it. I was heading to Chisinau at 12.40 pm, so basically I bought my ticket just 20 minutes in advance and got on the next bus. This is normally OK, it’s not touristy at all – it’s only locals on the buses here. You will more than likely be the only backpacker in the entire country during your visit. 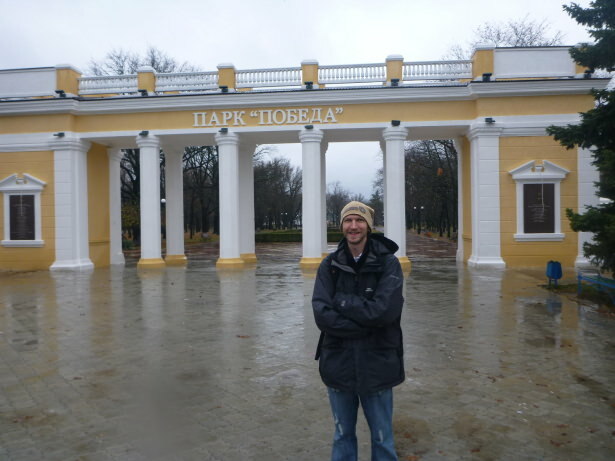 The only backpacker in Tiraspol. You then go to the bus (mine was maroon in colour) which has Chisinau written on it in Moldovan and Russian (I couldn’t read either but I recognised how Chisinau was written as I’d already come from there). The driver checks your ticket and you get on. Mine had an exact seat number, which was seat 8 so I sat there. The bus was full and at 12.40 pm we left. The bus from Tiraspol to Chisinau. When you leave Tiraspol, nothing much of note happens. You get to see the football stadium on the way out of town and suddenly you are in countryside. Less than an hour later you pass by the town of Bendery in Transnistria and then it’s onto the border. Once you are past Bendery you will see the departure point from Transnistria. Basically on the way in you were given 24 hours in the country unless you decided to extend that and stay longer. You get your extension by registering with OVIR. However, I was doing the 24 hour option only just to see the country and head back to Moldova. 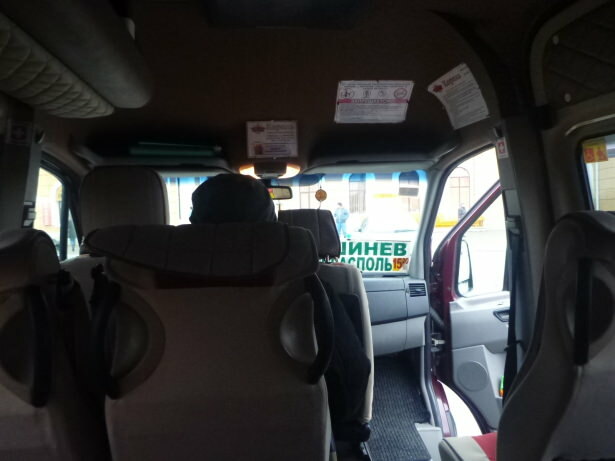 The bus from Tiraspol to Bendery and onwards to Chisinau. With the 24 hour visa option, you don’t get a stamp for leaving Moldova (complicated here, but Moldova doesn’t think you’ve left it – even though you are in a Russian speaking country with their own money, laws and government!) and you don’t get a stamp for entering Transnistria. You simply filled in an immigration form on your way in the day before. The immigration form has two parts to it – the Arrival form (which you handed in the day before at the Bendery border point) and the Departure form (which you still have with your passport and should have kept it). To leave the country, you simply surrender this departure form, which you filled in on your way into the country. You surrender the departure form (after filling it in of course). 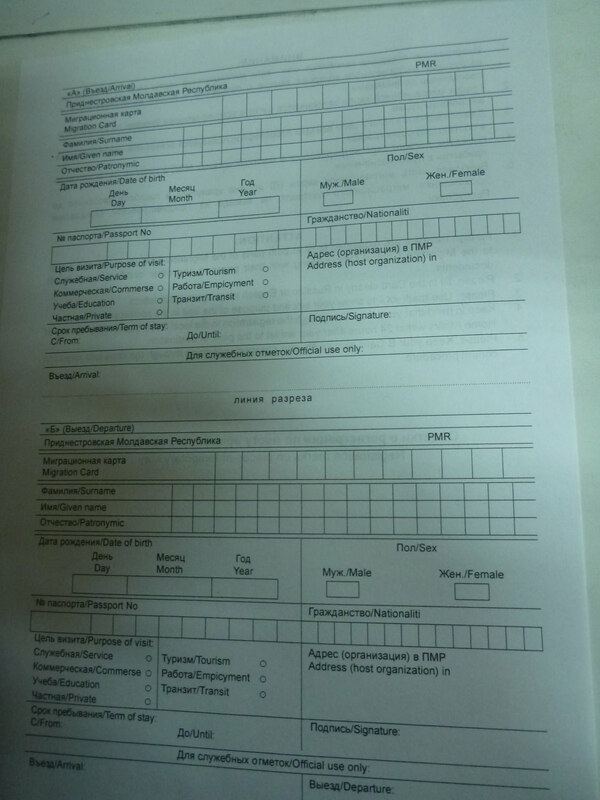 The departure form will have written on it the exact time and date you have to leave the country. 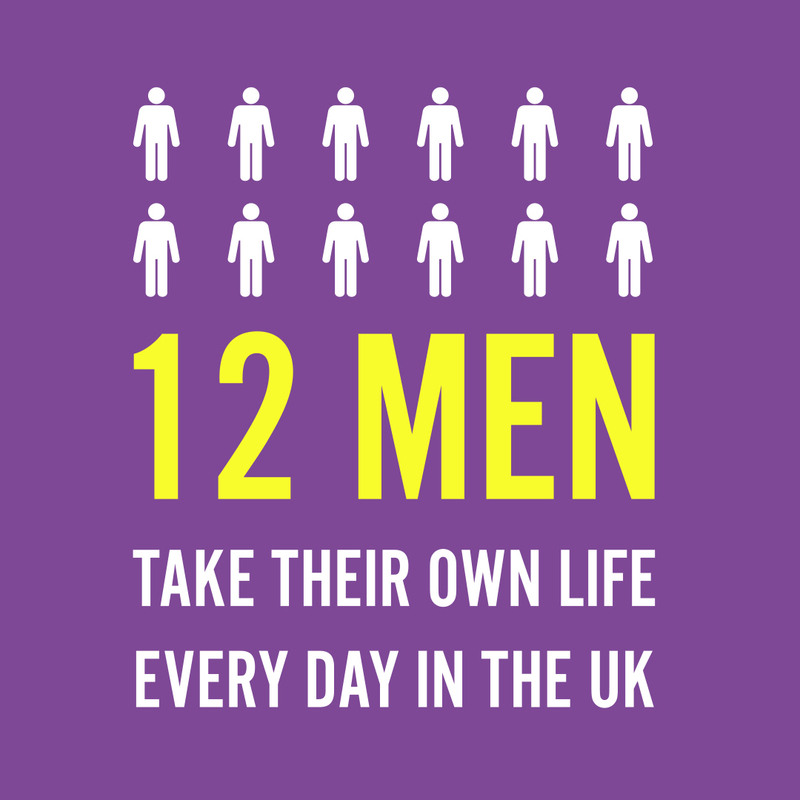 You are given exactly 24 hours these days (count yourself lucky – it used to be 10). My Departure form said 14.15 on it. So basically I arrived at 14.15 on the Thursday and had to be out of the country by 14.15 on Friday. I could have left either by land to Ukraine or to Moldova. There is no international airport in Transnistria. 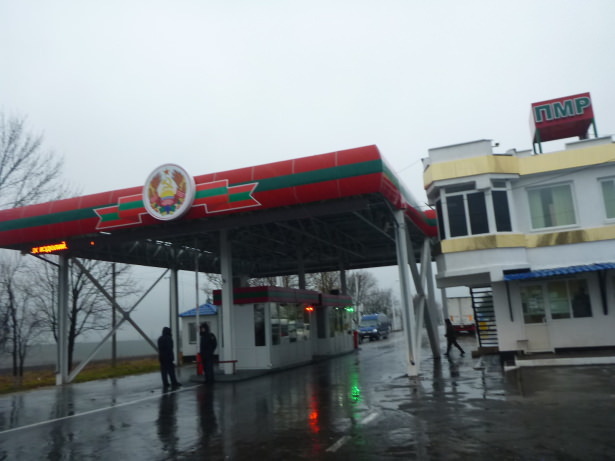 Border gate near Bendery, Transnistria. 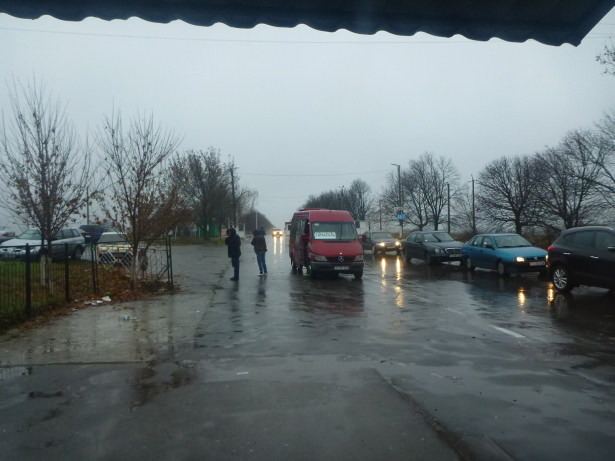 When we get to Bendery, an immigration officer from Transnistria gets on the bus to check passports – he did this with us – it was raining. If it’s not raining you may have to get out – but it was torrential rain for me. All he did was look at my passport, ask me what country I was from, check I hadn’t breached the time allocated on my 24 hour visa option and that was it. I was leaving in the 23rd hour (I probably almost used up my 24 hours in fact – think I left after 23 hours 45 minutes!). The immigration officer keeps the departure card and that’s it. You have now left Transnistria without any passport proof that you were there. Moldova side of the border. 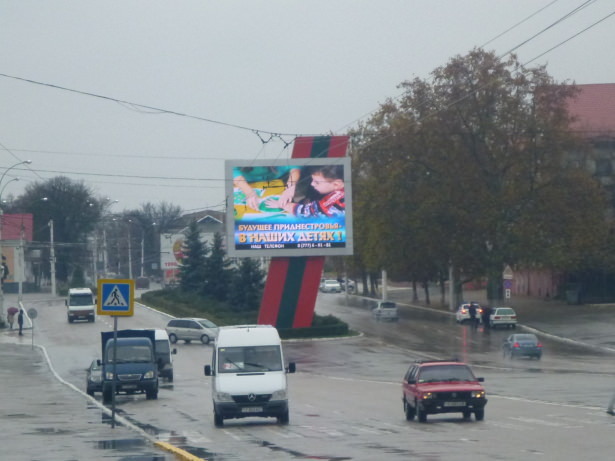 Now this is the thing – you are in Moldova as soon as you have left the departure point from Transnistria. But there is no arrival point or immigration of course. This is because Moldova do not recognise the existence of Transnistria and therefore don’t put any border control here. As far as Moldova are concerned, you were always in Moldova. Transnistria is in Moldova in their eyes, so no entry stamp and you simply continue on the road back to Chisinau. All in all the entire journey is hassle free, through dreamy countryside and takes less than 2 hours on a good day. It’s a really cool adventure to head to Transnistria, and I recommend it if you’re ever in Moldova. Just like if you are ever in Armenia, I recommend a side trip into Nagorno Karabakh. 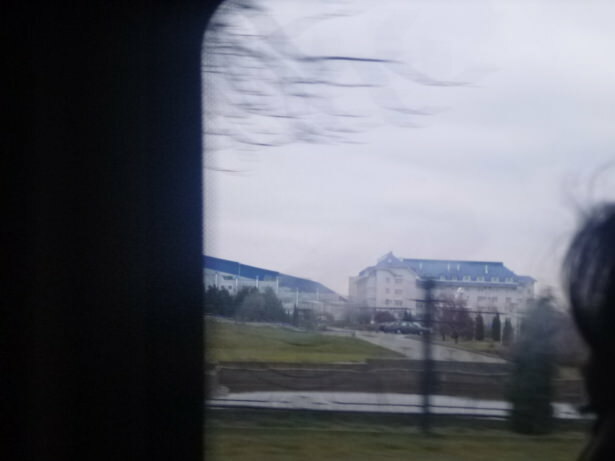 This entry was posted in Central Asia/Middle East, Chisinau, Destinations, Europe, Micronations, Moldova, Tiraspol, Transnistria, World Borders. Bookmark the permalink. This is why I love reading your blog Jonny, you go to all these places no one has ever heard of! Transnistria – wow what a name, not sure I could pronounce that. 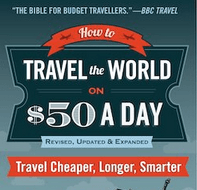 Great tips on the bus and border travel. 10 hrs in a country sounds harsh, glad it is at least 24 now. Hi Jonny, I love following your journeys, I am looking at either starting my journey in Bucharest and then onto Iasi in Romania or finishing my journey there. I am undecided which route to take…ie, Chisinau – Transnistria (Tiraspol) – Odessa, or Odessa – Transnistria (Tiraspol) – Chisinau, not that it matters too much I suppose. 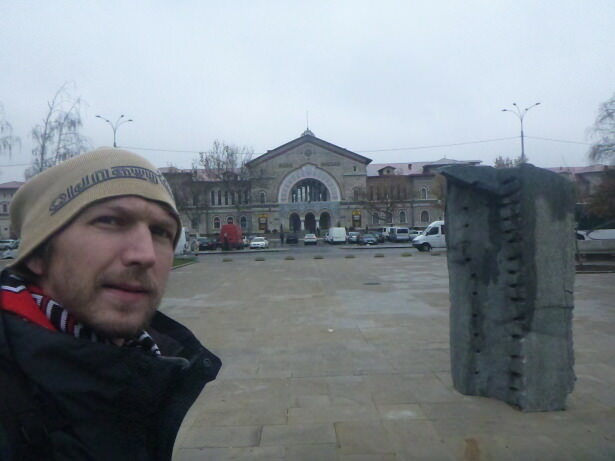 I have read on other sites that there isn’t much to see in Tiraspol or Chisinau. Can you please advise if staying 1 night in Tiraspol and 2 nights in Chisinau would suffice or would you say that you could see both places in a day for each place?